Over the last year, I’ve been slowly adding Pottery Inspired ideas for my girls’ bedroom. The one thing that has stretched our budget more than anything else, have been the ability to thrift and yard sales for treasures. Those items that are definitely “wants and not needs,” but that just make such a fun extra touch. Then I found these Pottery Barn canvas prints for $5/each. Compared to the retail, it was so worth the splurge. I took those pictures as inspiration for painting the walls, with paint that was OOPS paint picked up at Home Depot for only $5/gallon. (It looks darker in the picture, but it’s a bit lighter in person.) 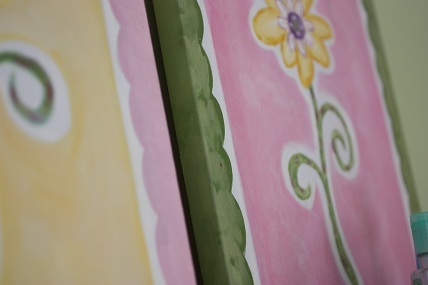 For absolutely no money, I copied the details from the edge of the painting onto the corners of the accent walls. This would be something easy to do in any child’s room. For boys, it could be a lightening bolt edging or curvy line. It’s just fun, and if you don’t like it, you can always paint right over it. Using scrapbookpaper that I already had, and a frame I bought at a yard sale, I painted the frame and made this Circle Art for just the cost of the dollar wood frame. 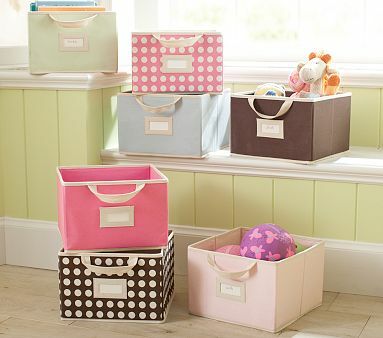 Frequently, I run across many canvas organizational bins at yard sale for a few dollars. I found the pink polka dot one and the solid pink one, which sits under the girls coffee table, and holds their American Girl doll finds. And last but not least, last Saturday, my Pottery Barn room was completed with this wonderful Pottery Barn rug treasure find. It pays to have patience when you decorate. If you don’t mind the treasure hunt, rooms throughout your house will slowly come together and the end result will be one you are thrilled with because the creative juices emerged, and your budget stayed in tact. I know these finds aren’t necessarily high end decorating taste, but I want to encourage all of you that you can add creative elements with only a few dollars budgeted each month. It’s fun, and being intentional with your budget is even better. Have you experimented with any frugal decorating ideas lately? I love the pink and green! I’ve always wanted to decorate a girl’s bedroom, but I only have boys (well, men now). Speaking of frugal, I finally got up the nerve to stop and pick up some outdoor tables in a neighbor’s trash. I’ve always been too embarrassed! After I passed by the tables twice, I went home and got my husband. Somehow with him it was less embarrassing! Check out my Projects post to see them. Have you ever picked up something from a neighbor’s trash? Great post, thanks for sharing! I think it is awesome when you can decorate your home beautifully on a budget. The more creative touches added provides extra warmth to the home plus you don’t use up all your money on one room! would love to see a pic of the room put together. The bits and pieces are great, but hard to imagine the total. I’ve been trying to get a room together for my girls with Pottery Barn inspiration (as well as Land of Nod). I cannot afford the bedding. Any low cost alternatives? I’ve even thought of sewing my own duvet cover but get overwhelmed in the fabric department. I love to wait and find things that are perfect for a room/spot/wall and cost very little! I just finished putting together my first collage/gallery wall in my living room – ALL things I already had – and everyone who comes in comments on it! So great that you put together so many cute thrifty finds. I too would love to see it all put together in one picture. 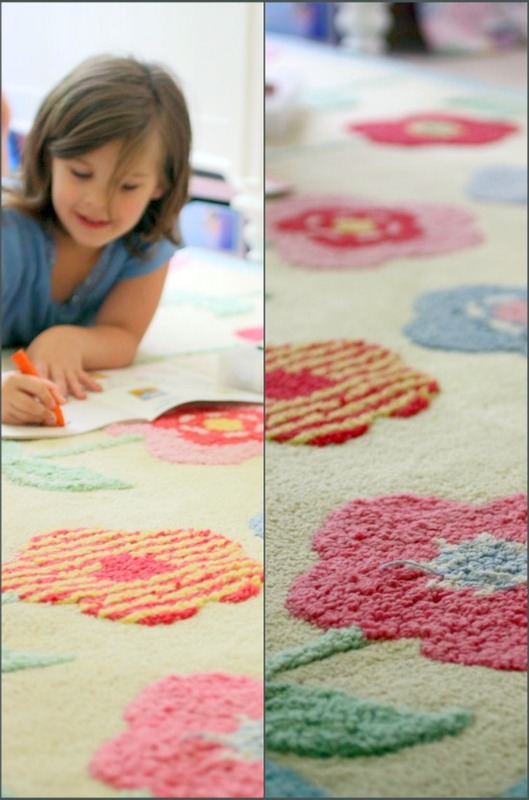 That circle art is so great – so easy – and a project we’ve used in different places in our house, too. My favorite frugal way to decorate my daughter’s room is with bow boards. A simple piece of artist canvas, some material, and clearance ribbon make some cute wall decor, and a functional storage for her clips and bows. I’m happy to write a tutorial for you if you want. Perfect. This would be an ideal DIY project for my two daughters this summer. I’ve been looking for some activities me and my kids could do this summer season. My hubby is planning to put up another garden (just for the kids) but I think it’s not yet the right time. These Pottery Barn collections is just what we need. 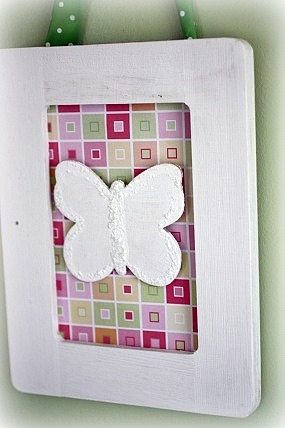 What I fancy the most is the frame wit the butterfly. 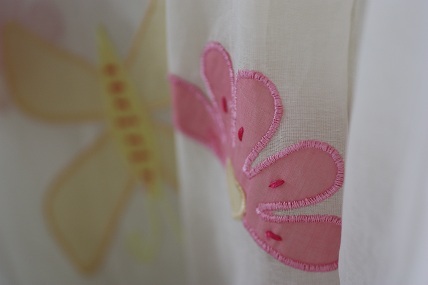 My eldest daughter loves everything with butterflies on it. I’m sure she’ll be happy with this project.